Respite Care is a service that pays for a person to come to a Veteran's home or for a Veteran to go to a program while their family caregiver takes a break. While a Veteran gets Respite Care, the family caregiver can run errands or go out of town for a few days without worrying about leaving the Veteran alone at home. Respite Care can be helpful to Veterans of all ages, and their caregiver. Veterans can receive Respite Care in an inpatient, outpatient or home setting. The program is for Veterans who need skilled services, case management and help with activities of daily living. Examples include help with bathing, dressing, fixing meals or taking medicines. This program is also for Veterans who are isolated or their caregiver is experiencing burden. 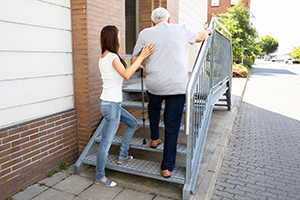 Respite Care can be used in combination with other Home and Community Based Services. Watch this video to learn more about Respite Care options for caregivers of Veterans. Am I eligible for Respite Care? Since Respite Care is part of the VHA Standard Medical Benefits Package, all enrolled Veterans are eligible IF they meet the clinical need for the service and it is available. A copay for Respite Care may be charged based on your VA service-connected disability status and financial information. Contact your VA social worker/case manager to complete the Application for Extended Care Benefits (VA Form 10-10EC) to learn the amount of your copay. Depending on the Respite Care services in your area, you can choose which options are best for you and your family caregiver. For example: If your caregiver has lots of errands to run or appointments, you could have a Home Health Aide come to your home while your caregiver is out of the house. If your caregiver needs time at your home alone, you could attend an Adult Day Health Care center for the day. Or, if your caregiver is out of town for a few days, you could stay at a Community Living Center (VA Nursing Home) during the time they are away. No matter which option you use, trained staff will help you with your care needs. You might stay in a Community Living Center (VA Nursing Home) for 1 visit of 30 days, or have 10 short stays of 3 days each during the year. You might have a Home Health Aide come to your home to stay with you for up to 6 hours in a row, day or night. Each visit (even if it is less than the 6-hour maximum) counts as 1 day of Respite Care. You may also be able to divide your 30 days among the 3 different types of Respite Care. What type of Respite Care does my family caregiver prefer? What mix of Respite Care options will work best? What is the best way to use the 30 days per year? If Respite Care seems right for you, your VA social worker can help you locate VA Respite Care services and assist with making arrangements. I like knowing that my mom can catch a break and do things she needs to do while not having to worry about me all the time. Getting Respite Care lets her take some time off! It's a relief to know that I can have help in caring for Sam when I have to take care of other priorities in my life. Since we live together, the best thing about Respite Care is knowing there are certain times I can take care of projects at home and Sam can get the care he needs while staying in a Community Living Center. This was a godsend when I needed to paint the place.